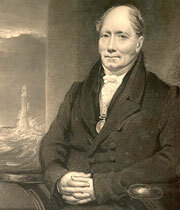 Robert Stevenson was born in Glasgow on 8th June 1772 and named after his paternal grandfather. His mother Jean Lillie (1751-1820) — also known as Jane — had married his father Alan Stevenson (1752-74) sometime in 1771, possibly eloping to do so. Robert was to be their only child and both parents were only 20 years old at the time of the marriage. Jean’s father, David Lillie (1710-74), a Glasgow builder and Deacon of the Wrights, had married her mother Isobel Miller (d.1774) on 27th May 1739. They presided over a large family of 12 or 13 children, of whom Jean was the sixth or seventh child. She had attended a private school for girls in Edinburgh. Alan Stevenson came from a family of Glasgow maltsters (brewers) and he worked with his brother Hugh (1749-74) for a firm trading in the West Indies. His father Robert (1720-64) had married his mother Margaret Fulton (c.1722 - c.1825) in 1742, and they had had 10 children. For young Robert's mother Jean, 1774 was a difficult year. Both her parents died. Then, on 26th May in St Kitts, Robert's father Alan succumbed to a fever described as 'night dew'. She was left alone with a toddler not yet two years old. Her brother-in-law Hugh also perished from a tropical fever in Tobago. However, three years later, on 19th April 1777, Jean married Glasgow merchant James Hogg. He is described variously as a gunsmith, weaver, hammerman and manufacturer. She was already pregnant and she gave birth to a son in October. The couple moved to the village of Milton-of-Balgonie, near Glenrothes in Fife, some time before the birth of their second son on 7th December 1780. They later moved to Edinburgh. But Hogg deserted Jean and went to England, leaving her once again in straitened circumstances and looking after Robert, who was still quite young. Robert's half brothers were not living with Jean at that time nor later — there is no record of what happened to them. Stevenson attended a charity school until he was about 14 years old. His mother had hoped he would become a church minister but lack of funds made that difficult, and in 1786 he took an apprenticeship with Edinburgh gunsmith, Francis Innes. By about 1791 he was described as a gunsmith himself. At some time during his apprenticeship, while he and Jean were living in Edinburgh High Street, Stevenson met the man who would have a profound influence over the future direction of his life — Thomas Smith (1752-1815). Smith was originally from Ferryport-on-Craig in Fife, south east across the Forth of Tay from Dundee. He had moved to Edinburgh around 1770 to set up his own tin smithing and lamp-making business. By 1790, he had premises in Blair Street and had expanded his interests in lighting to the illumination of lighthouses, including inventing an oil-fired reflector lamp to replace the coal fires or candles often used. On 22nd January 1787, Thomas Smith was appointed the first engineer to the Northern Lighthouse Board — the body formed in 1786 to be responsible for lighting the coast of Scotland and the Isle of Man. The Northern Lighthouse Board would figure significantly in Stevenson's life. But for the moment, in 1791, Stevenson joined Smith's workforce. He was embarking on the career for which he is now so famous — lighthouse construction.